Fiber optic reflectance spectroscopy (FORS) can be used as a rapid and selective method for the quantitative determination of low amounts of copper. 1-(o-carboxyphenyl)-3,5-diphenylformazan (CPF) was used as a coloring reagent for copper after its immobilisation onto a commercially available Amberlite XAD-1180. The analyte in samples were extracted onto a solid sorbent matrix loaded with a colorimetric reagent and then quantified directly on the adsorbent surface by using a miniature reflectance spectrometer. The correlation between sample concentration and reflectance is described by Kubelka-Munk equation. The proposed method could be used at a neutral pH of 7. Commonly coexisting ions in natural waters did not interfere with the determination of Cu(II) ion. The precedure can be performed in almost every media. 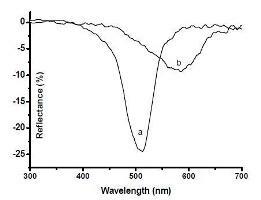 Cu(II) can be determined in the range between 0.06 and 2.2 mg L-1 with a detection limit of 0.02 mg L-1 and a response time of 7 min. The relative standard deviation (RSD) (n=5) for 0.635 mg L-1 Cu was 3.0%. This method was used for the determination of Cu(II) in different water and copper based fungicide samples with satisfactory results.